Some things in life are as easy as breathing. But for those with pulmonary disease, simply breathing can be a daily struggle. Lung disease is experienced by tens of millions of Americans, making it one of the most common medical conditions in the world. The lungs are part of a complex apparatus, expanding and relaxing thousands of times each day to deliver oxygen and expel carbon dioxide. Lung disease can result from problems in any part of this system, though most cases are connected to smoking, infections and genetics. Fortunately, new treatment options that more effectively target the disease and its causes are delivering hope to many patients. Lung cancer is arguably the most formidable of pulmonary diseases. This year alone, the American Cancer Society estimates that 221,000 new cases will be diagnosed. Both major types of lung cancer – small cell (SCLC) and non-small cell (NSCLC) – are caused by smoking and inhaling other toxins. However, adenocarcinoma, a type of NSCLC, is being found in non-smokers, women and younger adults under age 60. Deaths from lung cancer remain substantial; more than 158,000 people will die from it this year. Although cancer remains the second greatest cause of death in the U.S., it’s now ranked as the No. 1 cause of death in patients age 20 to 79. And, according to the Illinois Department of Public Health, cancer could soon overtake heart disease as the most common cause of death. If prevention isn’t possible, Bugno says, then early detection of cancer seems reasonable. In fact, clinical trials have shown that, when caught early, the death rate by lung cancer is reduced by 20 percent. In February 2015, commercial insurance agencies and Medicare endorsed a free, low-dose CT lung screening, comparable to mammography for early breast cancer detection. It monitors those at the highest risk: patients age 55 to 80 who are current or ex-smokers of 30 or more packs per year and who agree to be screened. Medicare covers the screening to age 77. “At Centegra, we’ve embraced this program and have screened more than 1000 patients in the past year,” Bugno says. But there’s much work ahead. Survival rates for lung cancer remain disappointing: less than one in five will survive for five years. By comparison, breast and prostate cancer patients have an 80- to 90-percent rate of overall five-year survival. Even in early detection lung cancer, five-year survivals are 50 percent; when locally advanced, it’s down to 25 percent, and when spread throughout the body, survival is less than 5 percent. 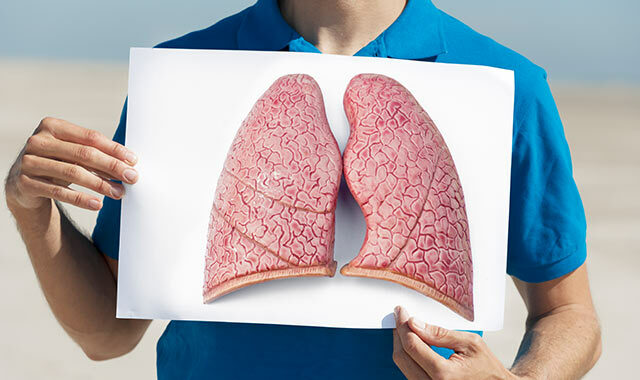 When diagnosed, lung cancer can be treated with a multidisciplinary approach that combines the best of surgical, radiation and medical oncology. “Supportive care before, during and after cancer-directed therapies can often be a major factor in overall outcome,” Bugno says. Radiation is typically applied locally. A 3-D energy drug targets cancerous tumors and adjacent microscopic areas while sparing normal tissue. The 3-D treatment planning, computer modeling and sophisticated technology provide greater uniformity in radiation dosing. Proper timing and sequencing with other therapies achieves the best results, says Bugno. Radiation therapy can be the sole treatment for early cancer; for locally advanced cancers it’s used in conjunction with chemotherapy and other systemic therapies. In recurrent and metastasized cancers, it can improve quality of life and symptom relief. About 85 percent of cancers are NSCLC. Since lung cancers can be local, regional or metastatic, a multidisciplinary, individualized approach is now standard. “Radiation has specific roles in each setting,” Bugno says. A new technique, Stereotactic Body Radiation Therapy (SBRT), can arrest and clear localized cancer deposits by delivering high doses of radiation into precise locations. Bugno says the procedure takes fewer than five sessions, using focused radiation beams and 3-D computerized planning, proper patient immobilization, radiation delivery algorithms and image guidance in which the actual region is viewed as it’s treated. SBRT for early lung cancers in selected patients achieves long-term cancer clearance of more than 80 percent, says Bugno. The facilities for performing radiation are also evolving. Future refinements are likely to include greater precision in targeting, timing of treatment, tumor sensitization and radiation protection of critical tissues, says Bugno. For lung cancers, radiation implants are not routinely used, but Bugno says that embedding radioactive substances into arteries that feed the tumors has shown promise for treating lung metastases to the liver. Radioimmunotherapy, which tags immune molecules with radioactivity to provide a “double hit” against cancer cells, is in the pipeline. Bugno says that, as an experienced oncologist, he must be a communicator and a champion for patient care while also being an ardent, passionate supporter of prevention and early detection efforts. It’s always better to prevent than to treat a cancer, he says. In the future, Bugno sees continuing exploration into technologies and standards that can improve upon current methods of cancer treatment. Chronic obstructive pulmonary disease (COPD) refers to a group of lung diseases that block airflow and make breathing difficult. Damage to the lungs from COPD can’t be reversed, but treatment can help to control symptoms and minimize further damage. Two of the most common forms of COPD, according to The Mayo Clinic, are chronic bronchitis and emphysema. The former is an inflammation of the lining of the bronchial tubes, which carry air to and from the lungs. Emphysema occurs when the air sacs (alveoli) at the end of the smallest air passages (bronchioles) in the lungs are gradually destroyed. Emphysema results in the loss of elasticity in a patient’s lungs, trapping air and making breathing more difficult. Exacerbation is a natural extension of COPD in which the patient’s baseline cough and congestion go beyond the normal day-to-day variations. The main causes are bacterial or viral lung infections and air pollution. Patients in this zone manage their COPD fairly well and have acceptable day-to-day fluctuations. Patients in the yellow zone experience elevated symptoms, such as more coughing and expelling more phlegm, that make it difficult for them to breathe and function comfortably. When COPD patients are hospitalized, Grabowski helps them to get their symptoms back under control, often through a carefully constructed action plan. “Hospitalization lasts for just a few days or much longer, depending on how severe the flare-up is,” Grabowski says. Flare-up treatments may include taking steroids to reduce inflammation and using bronchodilators to open up airways. In order to prevent these dangerous flare-ups, patients must follow strict sanitation rules. Beyond sanitation, a patient’s environment may also aggravate COPD symptoms. As pulmonary diseases go, cystic fibrosis (CF) is not all that common, nor is it widely recognized and understood as the serious threat to children that it is. The Cystic Fibrosis Foundation estimates that about 70,000 children and young adults worldwide have been diagnosed with CF, with 30,000 of those patients in America. About 1,000 new cases are diagnosed each year, mostly in children under the age of two. Jessica Rush, a registered nurse at Northwest Community Hospital in Arlington Heights, spent more than four years treating children who were hospitalized with CF. Now a specialist in respiratory nursing, Rush says the effects of CF are devastating to children and their families. “Children with CF look normal, in that they don’t really show how very ill they are,” she says. This life-threatening genetic disease affects the lungs and digestive system. A defective gene and its protein byproduct cause the child’s body to produce unusually thick, sticky mucus that clogs the lungs, leading to potentially fatal infections. The sticky mucus also obstructs the pancreas, stopping its natural enzymes from helping the body to break down food and absorb important nutrients. Rush says that, on top of the serious consequences of CF, these young patients also may develop diabetes. Today, infants at Northwest Community Hospital are screened for CF risk within a few days of birth, Rush says, although symptoms may not show up for a while. Warning signs include salty-tasting skin, persistent cough, frequent lung infections, poor growth and slow weight gain. Treatment for CF patients is constant, beginning with oral medications to compensate for the loss of digestive enzymes not being produced by the pancreas. These medicines are given with every meal as part of the treatment regimen. Several times a day, parents and medical staff must use their cupped hands to beat on the back and chest of the child in an effort to loosen the accumulating mucus. In addition to, or in place of CPT, a special vest can accomplish the same task by shaking the child three or four times each day. “When the child is hospitalized, we use the vest about every four hours,” Rush adds. And with CF, hospitalization is a fairly common event. In the hospital, the child is immediately given intravenous antibiotics to treat lung infections and inflammation. The average stay for a tune-up is two weeks, depending on how severely the child has been affected. Fortunately, tremendous advances in CF treatment have helped children to survive longer, and a new medication has shown promise in changing the statistics and fatality rates substantially. Continuous advances in the field of pulmonary disease prevention and treatment are helping more and more patients to breathe easier, thus extending lives and improving the quality of life. The future promises not only management but also outright cures for the lung diseases that have plagued mankind for millennia. This entry was posted on Monday, May 11th, 2015 at 12:00 pm	and is filed under Health & Fitness, Top Posts. You can follow any responses to this entry through the RSS 2.0 feed. Both comments and pings are currently closed.